i like the fact that the music has some random factor in it aswell, but most of the runs look too plain. abit unpolished/unfinished i guess..
Great idea, but the scenes which I got during all my tests didn't looked as promising as the one in the screenshot. Music was always nice, but that's not enough for my thumb up. wow ... that's original stuff ... great !!! pig for the procedural music. gfx were just boring. I liked this one, thanks for thinking what could be done dynamically! Sadly black screen only(radeon 9250). But the music plays well. Thumb up for procedural music. a bit too much white in many of the runs. cool concept nonetheless. Nice concept, and it looks fairly nice [most of the time]. altougn not all incarnations are perfect i like the concept. 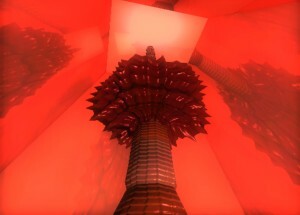 generative content is still not much explored in the scene... want to see more. added on the 2007-11-04 17:04:41 by ɧ4ɾɗվ. oh eh. radeon mobile x1400 on winxp. seen before and another ugly intro everytime you run it. Very cool idea! Sometimes a bit too bright or too dark but otherwise fine. Runs very well under default Wine configuration in Ubuntu GG, too! The compo runs were a bit dull, but this is still my new favorite dynamic demo! Sadly it's very ugly. :-/ You can do dynamic visuals without it looking crappy, see here for a great example: http://www.pouet.net/prod.php?which=3231 Removing the cubical part from the generation pool (however it should be called) would have helped a lot already. The most dynamic dynamic demo ever. The music system is totally cool. No headphones here, so no idea what the sound is like. I'll try again later perhaps with sound. The visuals left me unimpressed though, take a look around on the web at one people are doing with procedural graphics. Nothing new and could have been done in way less I'd imagine. imo it missed the potential in the dynamic demo concept and barely scratched the surface. seemed rather like a 3d fly-by with randomized objects and paths. Great randomizer, a bit dull demo. Still, thumb up for the randomizer! Music didn't really give it much of a boost.. as others said, it's more just randomised than generated. Great execution for the randomization routine.. I think it'd make a great start for higher-level refinements. It's good. Shame for the compo though it was the only entry. gets a bit boring after all but still somewhat cool. Cool concept. Maybe you could reduce certain parameters (esp. colors) to more useful ranges and better options for syncing (the editing pace could vary). Wow! I run it again and again and watch many demos, ok it's actually the similar thing but good music atmosphere and the music also varies, very good idea and I really thumb this up!!! Oh, seems to have buggy behavior on geForce 8000-series gfx cards, the colors are clamped to totally black. Fixing the problem now when I've got some hardware available to test with. Forgot to comment this one.. Well it rocks, duh. Interesting idea, but that's just it. Random generators obviously don't do it for me, sorry. nice idea, deserved to win. page created in 0.019761 seconds with 15 queries.